How can you earn money purely from gaming? The notion of earning money with gaming is relatively new. Many people think that earning money by playing games can only be achieved through taking part in extremely difficult tournaments and esports championships. So what can people do to start earning money only by playing games? In this blog we will answer this question and give examples of things you can do to earn money from playing games. This sentence is false. While being an incredibly good player, you can just wait a couple of days for an invitation to join a team for championships where you can already earn a lot of money pretty much for showing your face. Others who are just good or very good, need to step up themselves first. the Internet is full of websites that offer smaller in size tournaments for various games such as League of Legends, Heartstone or CS:GO. But more on that later. If you enjoy playing multiplayer games, why not consider making money out of it? And while it might force you to do things you are not particularly enjoy, which is “farming gold” or various in-game items, it certainly can get you steady stream of money if you decide to sell it for real money. As an example, it is worth mentioning that well known game Diablo 3, before the release of the expansion had its own implemented real money auction house system (RMAH). Humorous thing to say is that many people claimed to be playing not Diablo 3 but “playing RMAH”, because the only thing they were doing in game was sitting on auction house, buying best stuff for small price and selling at at least 10 times its initial price for either in-game money or real money. In case of in-game money it was later resold for real currency. On the more against TOS note, many people used to buy 5 or even 10 accounts and used bots to play and “farm” the items automatically and then sell it for insane amounts of money – this offense was heavily punishable, but considering that before permanent account(s) ban, players managed to earn at least 50-60 times the worth of the game, it wasn’t really an issue to buy another 5-10 copies of the game to continue where they’ve let go. 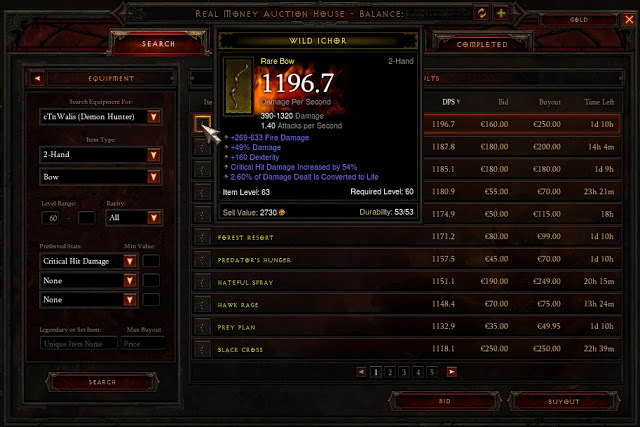 When it comes to Diablo 3, the most dedicated RMAH players managed to earn around $100 000. Currently Diablo 3 has no means of legally earn real money in-game. Certain items were worth much more than maximum allowed on RMAH. You may only imagine, how are those people who paid hundreds of dollars for single item may feel now, that those items aren’t even worth a penny (due to expansion release). Other games where you can earn real cash are Entropia Universe, Team Fortress 2, CS:GO and many many more. This is more of a one-time deal, however the prices of an entire game account may be massively huge, starting from mere 100$ to even hundreds of thousands of dollars. If you own an extremely unique character skin, achievement, item that cannot be transferred between accounts, then it is highly possible that you can sell your account for a huge amount of money. One single ship in EVE online was valued at $5 500, however it most likely took huge amount of time to build up a ship that is worth this much. Years ago, when gearing up in World of Warcraft was an extremely difficult task to do, accounts of best players were valued at 8 to 18 thousand dollars. Downside to that is that Blizzard is pretty good at detecting sales of such exceptional accounts, which is against their TOS. After release of Wrath of the Lich King expansion, values of accounts started to fall dramatically as gearing up became much easier. While, from time to time you may get to enjoy certain game long before its release, being forced to play through particular gameplay sequence hundred times over might seem like a nightmare, especially if it’s extremely buggy and glitchy. Another thing is that the bigger the game, the greater the risk. Signing NDA’s in those situations is pretty common, and accidentally spilling out parts of the game to your friends might cost you a lot. Wish it was that easy, huh?! Live streaming and game recording are on the rise. Showcasing your gameplay with unique attitude may bring wonders. The thing is that people pay for what they enjoy – if they enjoy your gaming content they might pretty much consider donating in order to help your channel grow. Additionally, keeping an account on YouTube may allow you to show ads to your viewers so you may earn some money. It’s hard to provide an average amount of money someone might earn from donations and ads. It all depends on your viewers after all and how much they enjoy your content. You have to realize that your channel is most likely not the only like they keep watching on a daily basis – so you just as well may assume that someone has a better content and your viewer decides to donate to that person. However, depending on your country, for a monetized channel with possibility to donate and 50 000 subscribers, you may earn somewhere between $216 and $3 500. If you are looking to record and live stream your videos, be sure to check out our screen recording software Mirillis Action! if you still do not own it. If you want to become extremely popular, but doesn?t really know how to make a great YouTube channel, it will be enough to show up once on the biggest esports championships once and then create a channel on YouTube and everyone will want to see your awesome plays. But lets stick to the esports alone. The richest gamers are precisely those who take part in those tournaments. While in 2013 the best players managed to earn ?tens of thousands of dollars? per tournament, nowadays in 2017 those numbers begin to grow to ?millions of dollars?. It is estimated that since esport industry is growing rapidly, players will also start earning much more. However becoming a professional esports player isn?t easy, and requires insane dedication. If you have job that takes couple of hours a day, you probably won?t have the time to catch up to other players who have to train for 10-13 hours a day to even become close to being competitive. Keep in mind that each and every method described here brings some sacrifices to your gameplay. Even when you simply stream your gameplay, you will have to somehow adjust your behaviour to your viewers which might already take some fun out of your gameplay. Recording videos takes additional hours from your game-time as you need to prepare, edit, script and render your video – this may take hours out of your free time. All in all, if you are motivated, then ?nothing is impossible?